Stunning pair of studs added to our Jewelry For Less collection. These earrings are expertly crafted in 14K yellow gold and showcases real diamonds. Radiant with 0.75 ct. total weight of diamonds, these studs are high polished for a bright shine. 14K White Gold Diamond Solitaire Accent Flower Halo Stud 6.25mm Earrings 3/4 Ct. Stunning pair of studs added to our Jewelry For Less collection. These earrings are expertly crafted in 14K white gold and showcases real diamonds. Radiant with 0.75 ct. total weight of diamonds, these studs are high polished for a bright shine. 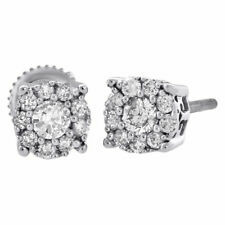 Diamond Octagon Studs 10K White Gold Round Cut Pave Earrings 0.95 Tcw. Stunning pair of studs added to our Jewelry For Less collection. Screw-backs for secure wear, these earrings will make a great gift for any occasion. These studs are 16.75mm wide. Great gift for any occasion. Gold Purity : 14k ( Hallmarked ). Diamond Detail. Diamond Wt : 0.78cts. Diamond Color : I/J. Diamond Clarity : SI2. Diamond Shape : Round. Gold Detail. Gold Wt : 2.800gms. This pair of 14k yellow gold diamond stud earrings weigh 0.7 grams. Each earring has a genuine round brilliant cut diamond, eye clean and set in a classy four pronged setting. These diamonds are eye clean and near colorless, and have been jeweler graded to be SI2 in clarity and H-I in color with lots of brilliance and fire. Gold Purity : 14k (58.5%) Pure Hallmarked Gold. Gold Color : Rose. Total Diamond Shape : Round. About Round Diamond. Total Diamond Setting : Prong (2 Prong Brilliant & Strong Setting). Total Diamond Cut : Brilliant Cut. Stone : Ruby (Lab Created). About Total Diamond. Total Diamond ctw : 0.89ctw. Total Diamond Color : I/J. Total Diamond Clarity : SI2. Total Diamond Shape : Round. About Gold Gold Color : White. Gold Purity : 14k (58.5%) Pure Hallmarked Gold. Total Diamond Shape : Round. Total Diamond Color : I/J. Total Diamond ctw : 0.75ctw. Total Diamond Clarity : SI2. Gold Color . Gold Purity : 14k (58.5%) Pure Hallmarked Gold. Total Diamond Shape : Round. Total Diamond Color : I/J. Total Diamond ctw : 0.96ctw. Total Diamond Clarity : SI2. Gold Color . Diamond Authentication Certificate Included. Kindly note that the photograph is digitally enlarged/enhanced version & the color of stone might vary as it is enhanced due studio light. An elegant creation, these 14k white gold martini style earrings features two round brilliant diamonds with a total weight of 0.91 carat (approx 0.46ct each). These diamonds were graded by AGI labs as a 100% Earth Mined Diamonds, I color, SI2 clarity enhanced, with Excellent Cut and proportions. To expose the true sparkle of the jewelry our goldsmith used 3-prong setting. These earring will arrive with a detailed grading certificate and with a retail value of $2,105. At Diamond BLVD, your satisfaction is guaranteed and your money is fully protected by our 30-Days 100% money back policy. These earrings are a part of our new diamond earring collection. Unique and modern, these diamond studs are set in 10K White Gold. These studs are 13.81mm wide. Style: Studs. Diamond Creation: Natural. Round Diamond Earring Jackets. Clarity SI2. 16 round diamonds=.95ct 2.4mm. Diamond Information. Resizing and Fees. Carat Weight. Stone : Sapphire. Gold Purity : 14k (58.5%) Pure Hallmarked Gold. About Round Diamond. Total Diamond Wt : 0.76ctw. Total Diamond Color : I/J. Total Diamond Clarity : SI2. Total Diamond Shape : Round. Gold Color : White. Signed NEI on the star- marked 14k. Beautiful 14k solid gold genuine DIAMOND STARBURST convertible STUD EARRINGS - each stud is about. 50 carats- there are 20. 03 small diamonds - totaling approx. -.75 carats. A pair of diamond studs is an essential indulgence for any lady or gentleman of bearing. Rarely have style and practicality co-existed in such harmony as in our stunning design. This beautiful pair of stud earrings encompass 2 round diamonds weighing exactly. 40 Carats each. Diamonds are E color and SI2 clarity. -. 86ctw total diamond weight of the pair. - 2 round brilliant cut diamonds (4.75mm, 0.43ct each). Jewelry Style: Studs. Stone Cut: Princess. Jewelry Type: Earrings. You can choose between White or Yellow Gold, with Screw or Push Backs. Stone Type: Genuine Diamond. A beautiful 14k white gold basket style earrings showcases two round brilliant diamonds with a total weight of 0.83 carat (approx 0.42ct each). These diamonds were certified by AGI laboratories as a 100% Natural Diamonds, I color, SI2 clarity enhanced and Ideal Symmetry. To emphasize the true brilliance of the jewelry our jewelry designer chose 4-prong setting. The certificate report accompanied with These earring states the characteristics of the diamond and with estimate retail value of $1,786. At Diamond Traces, your satisfaction is guaranteed and your money is fully protected by our 30-Days 100% money back guarantee. Main Stone Clarity: SI2. Total Carat Weight: 0.90CT. Shape: Round. Main Stone: Genuine Diamond. These earrings are made with genuine 14k white gold and natural white Diamond stones. Both earrings total a carat weight of. 75ct. Hallmark: 14K. These earrings are in excellent condition and have been professionally cleaned and polished. Clarity:SI2 Natural. Type:ROUND CUT. Setting:14K WHITE GOLD SCREW BACK SETTINGS. Certificate:GEL CERTIFIED AND APPRAISED. Gold Weight:1.00 GRAMS. Color:I tint yellow. Total Carat Weight:0.82CTS. SI2 clarity Brown color. Diamond Information. Photos have been enlarged to show detail. 8-2.8mm round diamonds. Resizing and Fees. Bright White Color And Clean Diamonds ! Low Bezel Set Center Blue Diamonds ! All Back Handmade Gallery Design ! Very Fine And Full Macro Pave And Bezel Set With Milgrain ! Available Matching Pendant too ! Beautifully graceful in its simplicity, these 14k white gold modern style studs features two round brilliant diamonds with a total weight of 0.83 carat (approx 0.42ct each). These diamonds were graded by AGI laboratories as a Natural Mined Diamonds, I color, SI2 clarity enhanced and Very Good Polish. To accentuate the glow of the item our jewelry craftsman chose bezel setting. These earring will comes with a 3rd party certificate and an estimate appraisal value of $2,344. At Natural Facet, your satisfaction is guaranteed and your money is fully protected by our 30-Days 100% money back guarantee. Delicate in design, these 14k white gold basket style earrings features two round brilliant diamonds with a total weight of 0.87 carat (approx 0.44ct each). These diamonds were graded by AGI laboratories as a Natural Mined Diamonds, G color, SI2 clarity enhanced and Very Good Polish. To accentuate the glow of the piece our jewelry craftsman chose 4-prong setting. These earring will comes with a 3rd party certificate and an estimate appraisal value of $2,111. At Natural Facet, your satisfaction is guaranteed and your money is fully protected by our 30-Days 100% money back guarantee. Diamond Earrings one diamond is IGI Certified and the other one is not. IGI 32773305. 1 princess diamond 4.39x4.28mm. Total Diamond Weight. Certified Diamond Information. Diamond Information. Resizing and Fees. SK Bridal Jewels-. Gold Purity : 14k. ©SK Bridal Jewels. About Diamond. Diamond ctw : 0.84ctw. Diamond Setting : Prong. Diamond Clarity : SI1. Diamond Color : I/J. Gold Purity : 14k (58.5%) Pure Hallmarked Gold. About Total Diamond. Total Diamond ctw : 0.77ctw. Total Diamond Color :I/J. Total Diamond Clarity : SI2. Total Diamond Shape : Round. Total Diamond Setting : Channel. Gold Purity : 14k. Stone : Pearl (Lab Created). About Total Diamond. Total Diamond ctw : 0.75ctw. Total Diamond Color : I/J. Total Diamond Clarity : SI2. Total Diamond Shape : Round. Gold Color : Yellow. This pair contains 2 Round Brilliant Cut Diamonds weighing 0.75ct in total weight set in a 4-prong basket setting with screw backs. This piece is the perfect gift and a must-have addition to her jewelry box! The diamonds are graded SI2 for clarity, and they are 100% eye clean! The inclusions are thin, white, and are mainly located towards the sides of the diamonds rather than on the tables. They blend perfectly into the sparkle and are invisible to the naked eye even under close scrutiny. MAKES A GREAT GIFT! COLOR: H-I, NEAR COLORLESS. SHAPE: ROUND BRILLIANT FULL CUTS. Hallmarks / Trademarks: "14K" AND DESIGNER TRADEMARK. Our Gemologist searches for unique fine jewelry to inspire, delight, and evoke emotion. Bright White Color And Clean Diamonds ! 100% Natural Champagne Color Diamonds ! Low Bezel Set Center Champagne Diamonds ! All Back Handmade Gallery Design ! Very Fine And Full Macro Pave And Bezel Set With Milgrain !